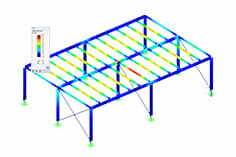 When entering structural data, how can I define a plane calculation to avoid defining supports in y-direction for a two-hinged frame, for example? The plane (2D - in XZ) or spatial (3D) model type can be set under "General Data". You can access the "General Data" dialog box of your structure by clicking the menu "Edit" -> "Model Data" -> "General Data". It is also possible to access the general data of the structure by right-clicking "Model Data" in the Data Navigator and selecting "General Data" in the shortcut menu. The model type can also be changed later.